How did the seo chicken cross the road to reach the conversion side? 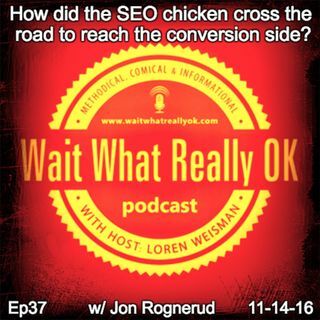 Wait What Really OK Podcast Episode 37 hosted by Brand Precision Marketing Strategist and Counselor, Loren Weisman features special guest, Jon Rognerud. This guy is one of the most sought-after SEO and Digital Marketing Expert out there. He has been creating and building online programs in B2B and B2C markets, from technology, software, financial services and real estate for over 15 years. On this episode we dig ... Más informaciones in to Search Engine Optimization, best practices, worst practices and simplifying concepts that are all too often pushed over peoples head by those that don’t even understand get it, themselves. His down to earth approach, experience, knowledge and proof of concept has built a career as a top level business management consultant to both large and small businesses around the world. How did the SEO chicken cross the road to reach the conversion side? ep37 of the Wait What Really OK Podcast is available on iHeartRadio or here on Spreaker. Podcast Blog Supplement for Episode 37 of the Wait What Really OK Podcast with Loren Weisman. Podcast Link Supplement for Episode 37 of the Wait What Really OK Podcast with Loren Weisman. What is a land page and why do you need one? w/ Jon Rognerud. Podcast Video Supplement for Episode 37 of the Wait What Really OK Podcast with Loren Weisman. Podcast Photo Supplement for Episode 37 of the Wait What Really OK Podcast with Loren Weisman.